Definition: Record that defines a set of financial books. In the old days of ERP, you were forced to log out and back in when you wanted to change companies. iDempiere has the ability to support multiple sets of financial books within the same login. iDempiere uses the Organization concept to manage and separate entities and their financial books all within the same application and login. Global inventory and service visibility and management from within a single login. Managing multi-company reporting without the need for a separate business intelligence or consolidation package. 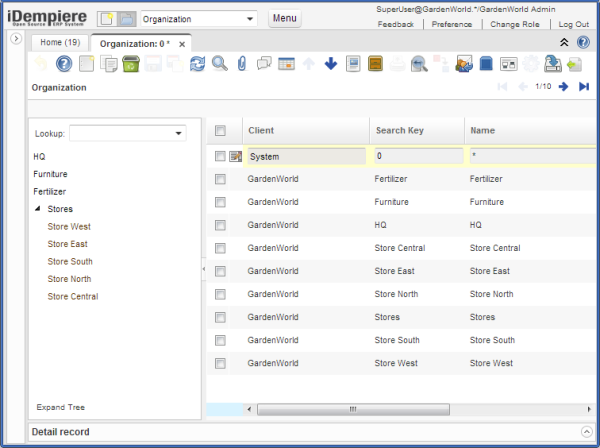 iDempiere’s GardenWorld sample client offers a good example of managing multiple organizations within the same system. GardenWorld engages in manufacturing and distribution. They manufacture furniture and fertilizer. The furniture is assembled in one location. The fertilizer is mixed in another facility. GardenWorld has five outlet stores to distribute their manufactured goods. The below image illustrates GardenWorld’s organizational structure. There are two types of Organizations in iDempiere: Transactional and Summary. A transactional organization can post to the general ledger. Documents like Sales Orders, Material Receipts, Shipments, and Invoices will always have a transactional organization. Summary organizations are used for financial consolidation. Summary organizations will typically contain one or more transactional organization nested inside. In the above illustration, the Stores organization is flagged as summary. It has each of the distribution center transactional organizations nested inside it. To produce financials for any store, simply run your Financial Reports for that store. To produce consolidated financials across all the centers, simply run your Financial Reports against the Stores organization. That’s it!! When you log into iDempiere, you are asked to choose an Organization. Please note that you are logging in with a “default” organization. This means that records you create (Products, Business Partners, Sales Orders, Shipments, etc..) will default to this organization. You have the ability change the organization before you save the record. Roles drive organization access. The role you choose during login dictates what organizations you can access. If you would like to learn more about iDempiere’s ability to manage multiple entities and financial reporting, I recommend you try the ERP Academy iDempiere Training program. It combines recorded explanations as well as live discussion about Organization topics.